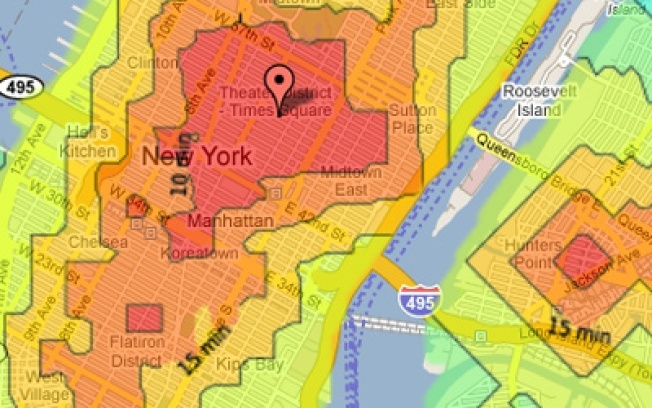 Color-code your commute in all five boroughs. If you're one of those people who's late to everything because you figure there's no way it takes 40 minutes to get from Boerum Hill to Lincoln Center (it totally does), Triptrop NYC is about to make your life a whole lot easier. Based on the number of subways nearby and their frequency, plus how far you need to walk to get to them -- plus a few other wildly scientific factors, no doubt -- the site calculates how long it takes you to get where you're going. And then color-codes your trip, from red (fast -- about 10 minutes) to blue (60 minutes and up). Example: If you're at Rockefeller Center, it'll take you 10-15 minutes to get to Astoria (because of the N train), whereas from the same departure point, you'll need about 40 minutes to get to Kips Bay (more complicated). Triptrop even lets you compare travel times between two starting points side by side by plugging in a pair of addresses. You have no excuse to be late ever again.